DA PROVINCIAL bosses, in an effort to garner support in areas presided over by traditional leaders and forge relations with royals ahead of the 2019 general election, met with leaders of the Eastern Cape House of Traditional Leaders (ECHTL) in Mthatha yesterday. Party provincial leader Nqaba Bhanga, Bhisho Legislature leader Bobby Stevenson, MPLs Sanele Magaqa, Nosimo Balindlela and their provincial spokesman Mlindi Nhanha met the newly-elected ECHTL executive committee led by Nkosi Mwelo Nonkonyana. Bhanga said that it was customary that a group of leaders was introduced to the local traditional leaders in order to develop and build harmonious relationships. “As we will be criss-crossing the province, including the areas of traditional leaders and in the rural areas, so we must exercise the customary practice to pay courtesy [visits] to royals before going to their land,” said Bhanga. 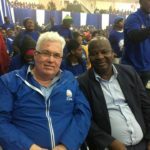 Nonkonyana and Nkosi Langa Mavuso, who are chairman and deputy chairman of both ECHTL and Contralesa, said the meeting was historic. They said that the issues of land and the incarceration of AbaThembu King Buyelekhaya Dalindyebo and the manner the matter was dealt with by the DA left traditional leaders fuming. Dalindyebo was a DA member, but his membership was terminated after he was convicted of his crimes. “We were not happy at all, our king was persecuted. We understand that the king was a DA member, but the manner he was addressed in public we did not like it,” said Nonkonyana. Bhanga said that they also came to introduce the leadership of the DA and personally congratulate the leadership of ECHTL.